The passenger compartment remained stable during the frontal impact, the windscreen pillar being deformed rearward only 2mm after the crash. Dummy results showed good protection of the knees and femurs for the front seat occupants. Additional test work demonstrated that occupants of different sizes and those sat in different positions would be similarly well protected. The passenger dummy scored maximum points in the frontal impact. Likewise, maximum points were scored in the barrier side impact test. In the more severe side pole impact, protection of the chest and abdomen were rated as fair. Good protection was provided against whiplash injuries in the event of a rear-end impact. In the frontal impact, forward movement of the 3 year dummy, sat in a forward facing restraint, was not excessive. In the side test, both dummies were properly contained within the shells of their respective restraints. The front passenger airbag can be disabled to allow a rearward facing child restraint to be used in that seating position. However, information provided to the driver about the status of the airbag is not sufficiently clear. The label warning of the dangers of using a rearward facing seat without first disabling the airbag was unclear, poorly positioned and not permanently attached. All of the seating positions are approved for universal child restraint systems. The bumper provided good protection to pedestrians' legs in most areas, but was poor in some places. The front edge of the bonnet provided poor protection and scored no points in Euro NCAP's tests. In most areas where the head of child might strike, the bonnet provided good protection. However, for an adult, the bonnet offered predominantly poor levels of protection. Electronic stability control is standard equipment. The front seating positions have a seatbelt reminder. A rear seatbelt reminder system is standard on the 6 and 7-seat variants. The system is available as an option for the 5-seat variant but is expected to be sold as standard in insufficient numbers to qualify for assessment. Hinweis: Andere Ausrüstungen werden zwar für das Fahrzeug evtl. angeboten, wurden jedoch im Testjahr nicht berücksichtigt. Euro NCAP is informed that the Seat Alhambra is structurally identical to the Volkswagen Sharan and has the same interior fittings and levels of safety equipment. 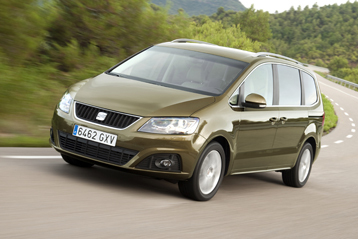 Accordingly, Euro NCAP believes that the star rating of the Sharan can also be applied to the Seat Alhambra.